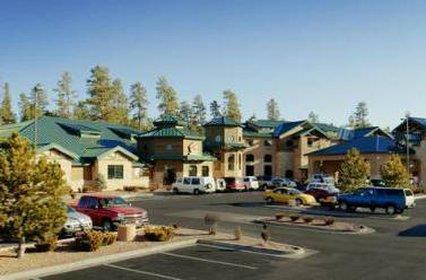 Guests of The Grand Hotel enjoy gateway access to Grand Canyon National Park and a variety of recreational activities. The lodge built in 1998 features the classic architecture and decor of Americas great lodges with rustic timber western ironwork and immense log beams. A central lobby with a towering stone fireplace invites good books lively games of checkers and inquisitive conversations with travelers from around the world. The nearby grand piano inspires guests to play their favorite tunes and sing along. You might even enjoy a spontaneous guitar and fiddle jam session going on in the lobby. On State Highway 64 in the village of Tusayan The Grand Hotel is only one mile from the entrance to Grand Canyon National Park and just seven miles from the South Rim of the canyon.